Get registered today for the UAMCC's National Convention!! This years convention is being hosted in Houston, TX on October 22nd, 23rd, & 24th!! YOUR ticket is worth over $500 BUT thanks to our incredible sponsors such as F9, Hydra Flex, ACR and MORE you can get your complimentary ticket today! At this years UAMCC's National Convention we have a great line up of speakers to help you grow your business! One of those amazing speakers is Bill Moebius! A little background on Bill is that he's the Senior Vice President of property management for Peloton and Peloton manages over 26 million square feet in property! He is going to be doing a Q&A for any and all contractors attending the convention! Come ready to learn! Get registered for the event as well as for his class using the links below! Get ready for the experience of a life time!! It's time again for the UAMCC's National Convention! 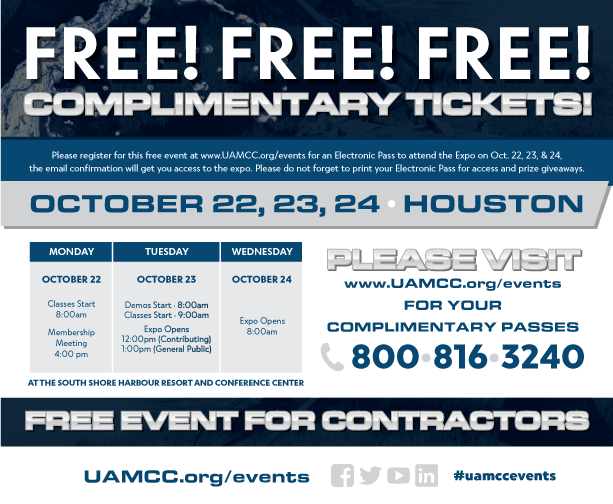 Join our staff, volunteers, Board of Directors, and amazing sponsors in Houston, TX on October 22nd, 23rd, & 24th!! Interested in bringing multiple people? Fill out the additional attendee section of the registration form and get everyone involved in the fun! Make sure you get registered for this years National Convention! This convention is being held in Houston, Texas on the 22nd, 23rd, & 24th of October! Get registered using the link below and sign up for classes to better your business and earn certifications! Get your complimentary ticket today! 22, 23, & 24 2018!!!! Attend our Classes and Educational Seminars and Earn Credit Hours towards Certification! Make sure you get your Complimentary Ticket by using the Link below!